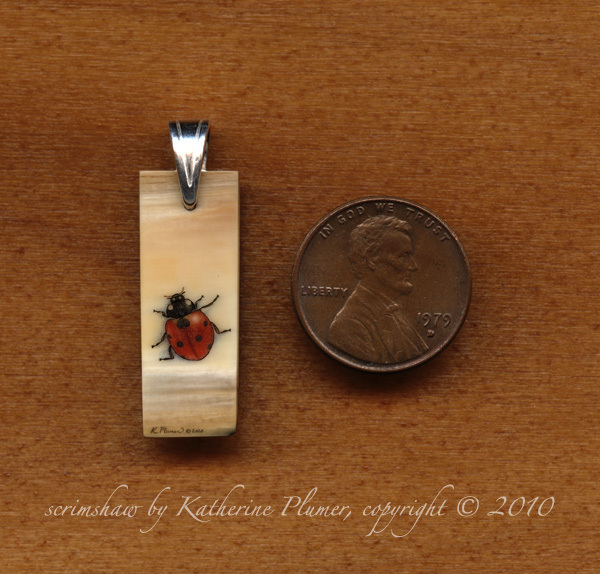 Given the popularity of the bee pendant, I thought a ladybug would be a good one too. I actually did this as my "donation item" for the Western Visions show... but I might donate something else instead. I don't know yet. 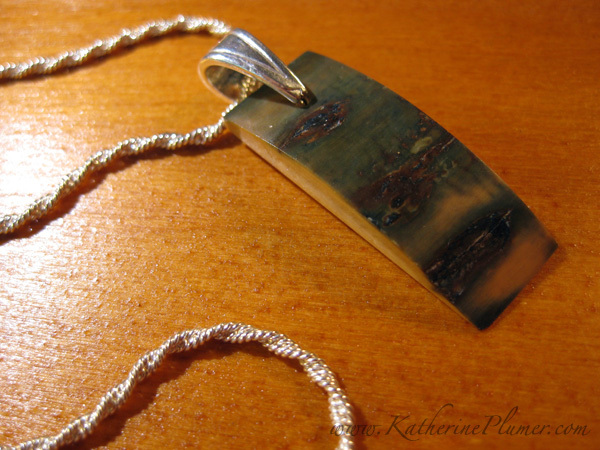 I am required to donate a piece to the raffle, or silent auction or whatever it is. I'll either put in this one, or sell this one and donate "Lion Around" instead. "Lion Around" lacks the impact of my current work, I'll readily admit, but has the novelty of being the third piece I ever did (if you're wondering, you'll likely never see the first one, and the second one is sold). Hmmmmm, we'll see. 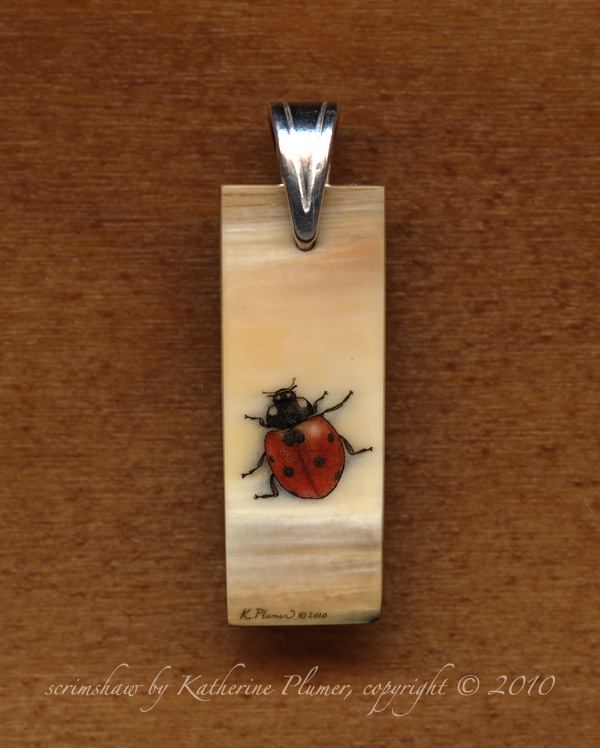 Anyway, the ladybug pendant is ~3/8 by 1-1/8 inch (10 by 28 millimeters) and is a multicolor scrimshaw on a particularly nice piece of mammoth ivory. The outer bark of the ivory is a very unique green and brown color pattern. Trompe l'oeil ... this is the scrimshaw equivalent of fake open manholes on the sidewalk! I like it. Too bad praying mantises are so big, that would make a huge necklace. 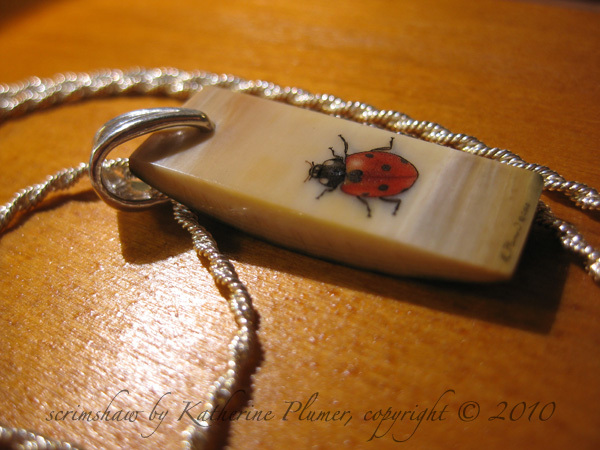 Now I'm getting ideas: an ivory collar just covered with bugs. A big scarab beetle broach. You do all animals so well, there are so many possibilities. I love that so much! Is it available for purchase in your store? Thanks Jan! I have several other ideas too. 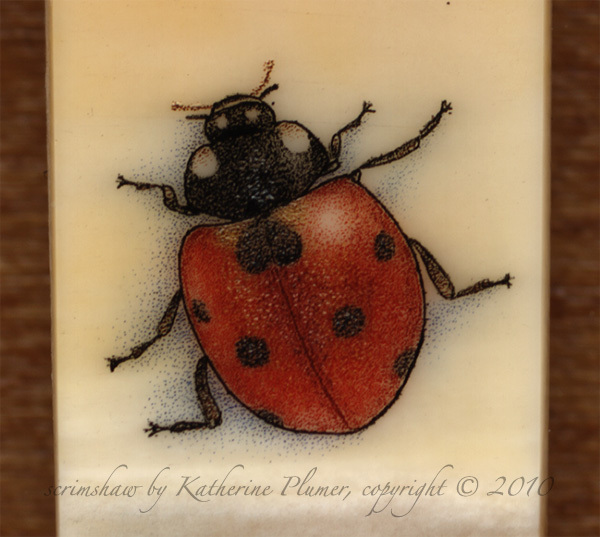 Bugs are tough as a subject because most people (me included) find the vast majority of them to be rather icky, so I've picked ones that are generally liked. Butterflies and mantids would be awesome but yeah there's the size issue. Then again, they don't have to be created for use as jewelry!